To make an appointment please ring 01248 364492 and inform the receptionist that you are a university student and that you would like an appointment. For the best possible care for all our patients we aim to see all patients who request an appointment within 24 hours. To help us achieve this we have pre-bookable doctor appointments up to 2 weeks in advance. For all other routine appointments we ask that you ring on the day that you need to be seen. Alternatively come to the reception desk at Bodnant to make an appointment. You will usually be fitted into the student health session. These are held twice daily. Please book an appointment at least 6-8 weeks prior to travel. Some vaccinations are not covered under the NHS and there may be a charge. A Medical Certificate is required for illness lasting more than 7 days, missed practicals and illness during exams. 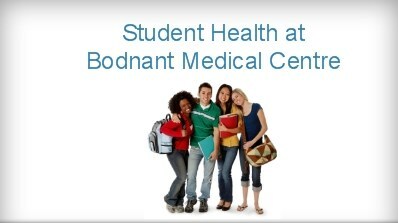 This can be provided in Student Health sessions. For illness less that 7 days, self certifying forms are available at Bodnant Medical Centre or in the student welfare office. For cervical smears, chronic disease checks and sexual health checks, a longer appointment time will be required. Please mention this when booking. If you feel that your problem is more serious and this includes depression please request a doctor appointment. Please always state if your problem is URGENT and you will be seen as soon as possible. Home visits are at the discretion of your doctor and are only available for the housebound and seriously ill.
All requests for house visits should be made before 11:00 and non-urgent visits may be allocated to another day. Please give the receptionist as much information as possible to help the doctor prioritise the call.